KIEHL’S first overnight firming mask, and first sheet mask! Kiehl’s just launched two new masks just in time for spring beauty regimens. The beauty of both masks is that you can use them at any time to address your skin’s varying concerns. There’s Kiehl’s Ginger Leaf & Hibiscus Firming Mask, $54 at Kiehls.com. The velvety new mask uses sustainably-sourced Ginger Leaf Extract, and botanical Hibiscus to improve dull and tired skin by morning. To use, simply replace your evening moisturizer with this formula—recommended five times a week—and leave on. The rich texture fully absorbs for overnight wear and smoother-looking skin by morning. The Ginger Leaf & Hibiscus Firming Mask also benefits the female farmers of Hoa Binh, Vietnam, where the Ginger Leaf is sourced. Kiehl’s is providing the 14 women who carefully collect the ginger leaves with education and new tools for safer, more efficient farming of Ginger Leaf. The masks are available online now and in stores on Wednesday, March 21. The other mask is Kiehl’s first sheet mask! 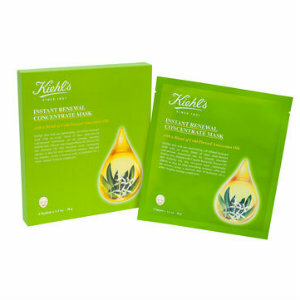 Kiehl’s Instant Renewal Concentrate Mask, $32 for four, at Kiehls.com. The oil-infused hydrogel-bio cellulose mask includes a blend of three cold-pressed oils from the Brazilian Amazon: Copaiba Resin Oil, Pracaxi Oil, and Andiroba Oil to help provide immediate hydration and softer feeling, smoother looking skin over time. The formula is infused into the mask material allowing the skin to be indulged and replenished with moisture that’s not greasy. The two-piece mask comfortably adheres to the skin for intense nourishing moisture and, after just ten minutes of use provides hydration for a softer, brighter looking complexion. I just discovered the entire line of Pharmagel’s pharmaceutical-grade and age-defying skin care products. Pharmagel’s line of cleansers, moisturizers, toners and treatments fit any skin type. The company has been around for 25 years and offers 22 products, seven professional sizes, and 14 corrective treatments. I’m especially loving the DN-24 Hydracreme designed to help improve the skin's appearance. It contains Retinol, which helps skin to appear revitalized and youthful while minimizing the appearance of fine lines. Vitamins C, B, D, and E helps to hydrate and energize and help skin appear more youthful. And, I love the new Nourish Oil, a luxurious blend of 12 natural oils including Argan, Seabuckthorn, Marula, Cranberry, and Avocado oils helps preserve skin's youthful appearance. This lightweight formula absorbs quickly to provide a boost of vital moisture and quench skin without leaving a greasy residue. It’s perfect for bedtime. Pharmagel products make a great Valentine’s Day gift and if you order online, you’ll save 15% by entering code VDAY now through Feb. 15. For the complete line, visit – pharmagel.net.